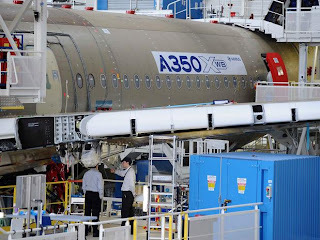 In the article written by David Learmount, it is stated that Airbus is going to train pilots for its A350 XWB differently. 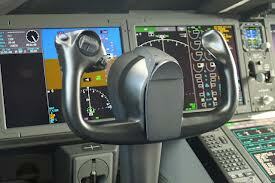 The first 3 days in the A350 simulator will be about letting the pilots find out that it is "just another aeroplane". Without using any of the sophisticated flight guidance systems they will be able to find out how it flies and what that feels like. These pilots may not have done that for years on the aircraft they fly now, so they might find out a few things about themselves as well as the A350. Airbus' flying training manager David Owens said that pilots will not be allowed to switch on the automatic systems until they have learned how to fly the aeroplane. Although Owens didn't spell it out, it seems Airbus is beginning to learn that never letting the pilots treat the aeroplane like a flying machine means they never find out what it can do. And more importantly, what it can't. 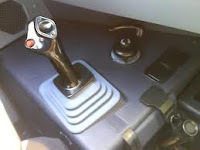 Loss of control has, in the last 20 years, become a killer phenomenon. But really what is behind this change of training philosophy is the difference between Airbus and Boeing regarding the sidesticks (Airbus) and control columns (Boeing), with their pros and cons, same as autothrust and autothrottle. There were too many incidents/accidents that could be avoided if the crew had a more thorough knowledge of basic flying skills. And this is the way for pilots to practice for Loss of Control in various situations. Many times, automation overreliance or dependence appears to be a type-agnostic problem. Airbus sidesticks and the lack of tactile feedback. But we have to remember that pilots are in charge of the aircraft, NOT the computers and that they will have to take over whenever they deem necessary. Will our future pilots be able to fly their aircraft without the assistance of autopilots and computers when necessary if they never get the chance to practice these skills during normal operation? A related factor is that a pilot whose job is merely to watch the aircraft fly itself is unlikely to be as well motivated as one who can get his or her hands on the controls now and then. Designers of future aircraft and airline managers must address the issue of how much and under what conditions pilots should be allowed, or indeed encouraged, to fly manually and without guidance systems. It is likely that compared to a mere aircraft monitor, a skilled, motivated pilot will always make a greater overall contribution to flight safety. 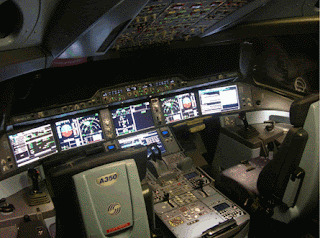 Airbus, pushed by Airlines working within the development team of A350 XWB in the Airline Office, is increasing the amount of hand-flying to give in the flight simulator, with first 3 FFS sessions mainly dedicated to raw-data flying and later on, with a lot alternate/direct law flying, which (by necessity) will be also hand-flown. But Airlines should change their minds too; under a vague "use the automation level appropriate for the task", Airlines should not read as "use full automation at all times” asking pilots to keep maximum automation level at all times. But, why limit the new philosophy to the A350 XWB? 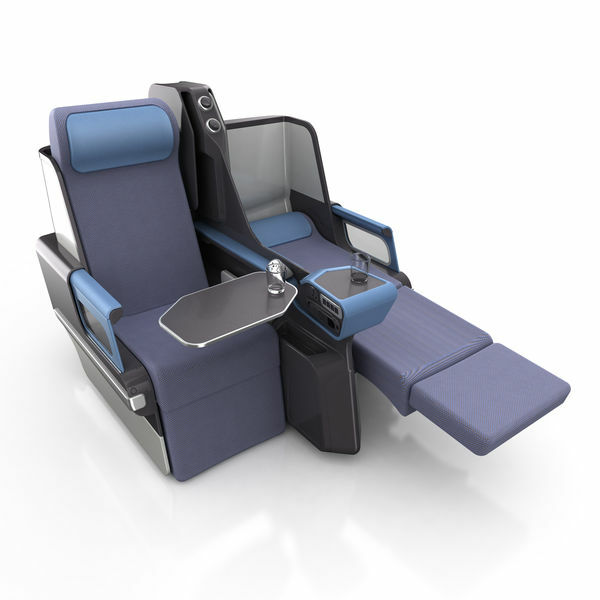 New french business-class seats included in the A350 XWB catalogue. More choices for customers. Zodiac Seats France (formerly Sicma Aero Seat) is the new A350 XWB Airbus Contracted Supplier (ACS). -the Cirrus seat, typically in a 4-abreast herringbone configuration, for long-haul market, as a top-comfort seat. -the Arcus seat, typically in a 7-abreast forward-facing arrangement, for regional and higher density business-class. Both seats convert into full-flat beds. 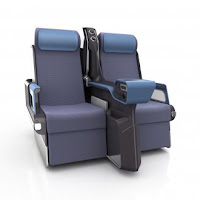 Zodiac Seats France's joining A350 XWB Airbus Contracted Suppliers follows that of JAMCO America with the “Journey” seat and Sogerma´s “Solstys” business class seat . Customers told Airbus they wanted the latest generation IFE products from Panasonic and Thales. But during customer focus groups two years ago airlines also said they were interested in light or simplified IFE solutions as well. “So we have listened to the market and there is an ongoing RFP with the different suppliers to offer light IFE,” says Hrnkova, “which could be seat-centric or another type of solution”. 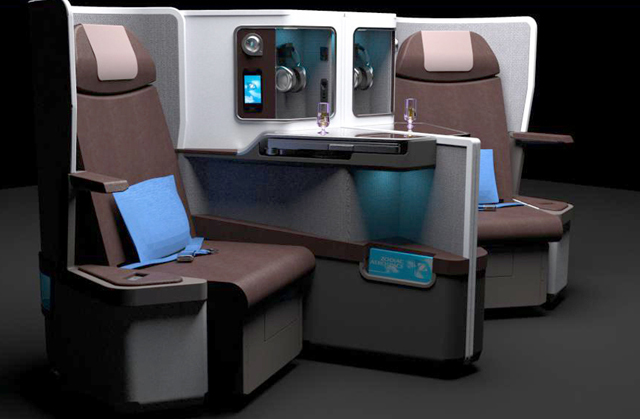 Airbus’ decision to close-in on a light IFE supplier partner coincides with recent declarations made by The IMS Company that it is now ready to consider line offerability of its seatcentric RAVE system after both airframers and airlines pressed the company to make RAVE available on new-build aircraft. 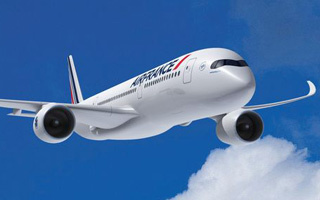 It is also conceivable that Airbus could decide to offer wireless IFE as an option. 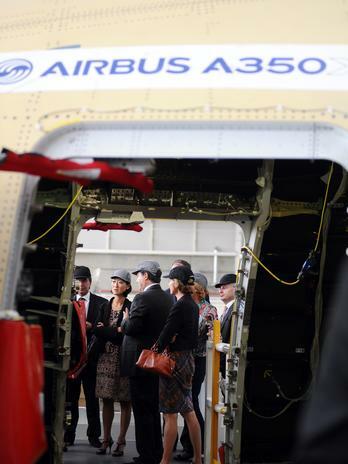 During a visit of Ms. Fleur Pellerin, the innovation French Minister to the Final Assembly Line in Toulouse, she has been able to watch the Static Specimen Test aircraft where the wings that arrived on the first days of September, are already joined to the fuselage. The assembly goes quickly and teams are actively working on preparing the upcoming tests. 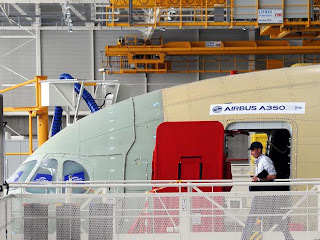 The Vertical Tail Fin VTP of A350 XWB is assembled at Stade Airbus facility close to Hamburg. 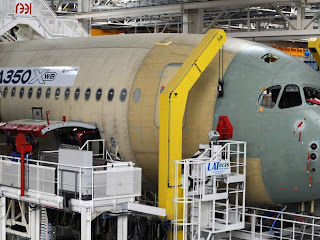 The composite and metallic parts of the VTP are supplied by Aciturri (Spanish Tier1) and assembled by Airbus team, with a huge background on this kind of assemblies; VTPs for A330 and for A400M are also assembled at Stade. Just before installing the Rudder (that is received finished from another Spanish Tier1, Aernnova) a final inspection is done with the VTP in vertical position. 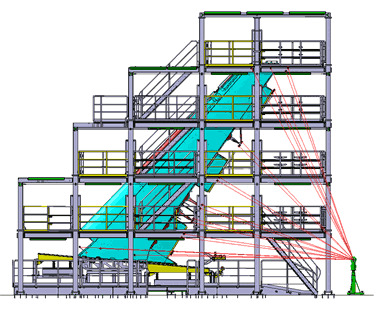 It is performed with laser-tracker measuring equipment, being inspected the hinge line, front spar and left shell. Metromecanica is the company with big know how in industrial metrology that has set-up the equipment and done the programming to standardize the measurement, as shown in the croquis. 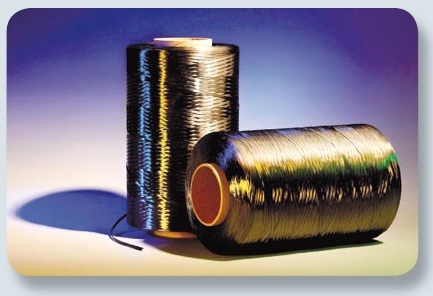 With the theoretical surface reference, the operator will quickly and in a standard basis place the measuring accessories with the reflectors of each of elements to be inspected. 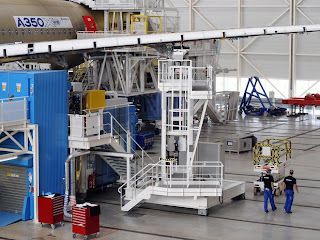 The VTP inspection is very important as the Rear Fuselage & VTP junction represents a new concept of interface for Airbus in comparison with previous programs since it is a structural attachment using titanium fittings as well as tensile and shear bolts. What is Boeing waiting for to strangle the A350 XWB with the launch of new 787-10 and 777-X? In this interesting post at AirInsight it is analyzed the future of Boeing after 787 has began deliveries, is already in service and is facing the ramp up. Now, the 787-10 and 777-X are the next targets as Boeing readies its 737 Max series to compete with the A320 neo family. But Boeing, which had favorable reactions to information on both new wide-body models after discussion with airlines, appears to be waffling from previous, unofficial commitments to launch these programs in 2012, after the change in CEOs at Boeing Commercial Aircraft. Former CEO Jim Albaugh appeared ready to take recommendations to the Board of Directors by year-end. His successor, Ray Conner, will only say the recommendation will go to the Board when it’s “ready,” but still vows an EIS by the end of the decade. With two new models that could bracket the A350XWB in the marketplace, industry pundits are speculating on why Boeing appears to be nebulous. The A350-1000 has much better trip costs and is a far more economical and superior product than today’s 777. All new 777-X or 777-300ER re-engining and major overhaul? Boeing is undecided more than ever before whether a major make-over In the form of the 777X is the best course or a minor makeover of the 777-300ER will be as good as the A350-1000. Reasons: engineering shortage and/or money shortage? 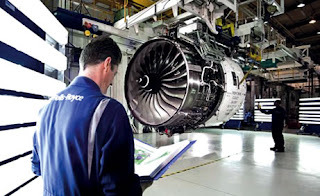 Has Boeing the capability or the ability to develop and deliver on multiple programs?. Can Boeing rebound and handle multiple developments at once? Has the 737 Max, which will be a tough development to meet its design goals, taken top priority? Fund shortage forced with 787 to fundamentally change Boeing’s strategy to include risk-sharing from suppliers to get the program approved. Is Boeing ready to repeat the risk-sharing partners experience in new developments? The engineering team working in A350 XWB project was moved before summer to the new "Spirit Nashville Design Center" and employs about 30 people. 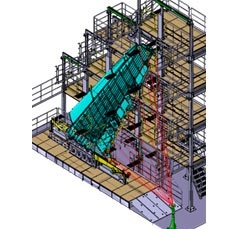 The Nashville engineers’ focus is work on the Airbus A350 and some defense programs and are in a different facility than other engineers working in Boeing projects. 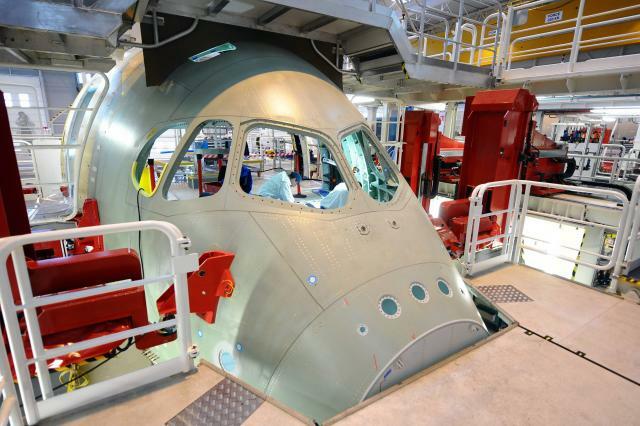 The complex section 15 centre fuselage, produced by Spirit AeroSystems, is a critical component. 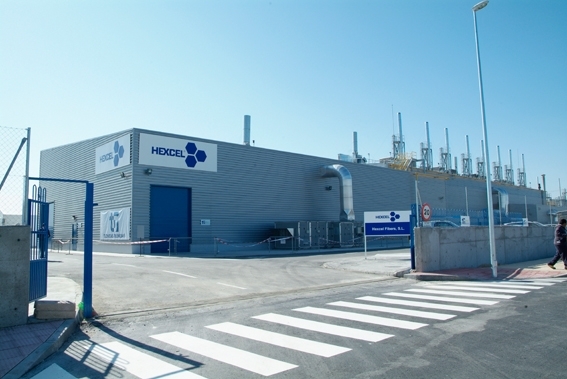 It was the source of concern for MSN5000 Static Test especimen. And remains identified as critical; Didier Evrard "can't say everything is fully bridged" regarding the production process, but he is confident that the section for MSN1 will be ready by the end of September. Spirit AeroSystems Inc., the largest U.S. supplier for the A350 structure is still working to produce parts of the plane more efficiently, said chief executive Jeff Turner in a recent interview. “It’s not going as well as I’d like,” he said. 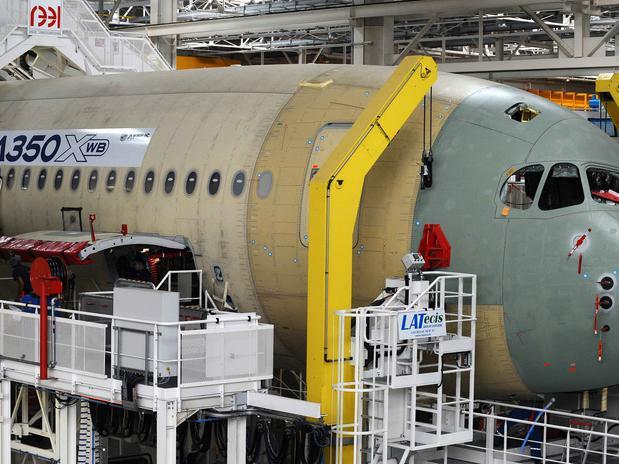 Spirit and Airbus have said they are cooperating to meet ambitious production targets for the aircraft. 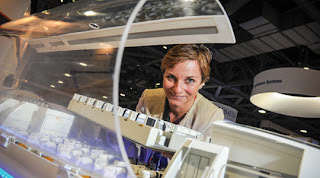 Visitors only can look at an A350 XWB miniature at the EADS booth and at Airbus stand during the ILA Berlin Air Show. A320 Sharklets of AirAsia, A380 of Emirates and A400M flying display are tris year the main show stars of the Air Show that was inaugurated by Angela Merkel German Chancellor with speeches from Tom Enders (EADS CEO) and Fabrice Bregier (Airbus CEO). #364 aircraft delivered since January and …. neither news from A350 XWB nor any photograph of big sections arriving to the FAL. The other wing for ES-static specimen and the Rear Fuselage for MSN001 are the photos that could be good “breaking news” for all media in the show. But they have not arrived on time for the Air Show and missed the train.